My boyfriend is a musician, and I spent some time as a music store nerd. Not High Fidelity–level of nerdery, mind you, but I can throw down with some pretty good music trivia and am generally fairly knowledgeable about music history (though no, I don’t play an instrument, and the music world thanks me for it). So we tend to gravitate towards musically oriented things, including museum “fancy instruments” exhibits. The following pictures were taken at Boston’s Museum of Fine Arts (Go MFA!) during one of our winter visits. 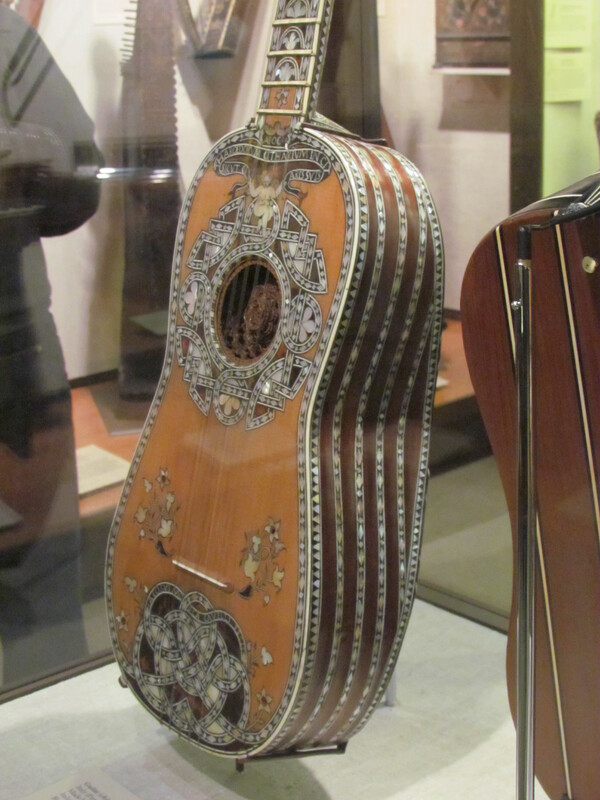 The MFA has a fantastic exhibit dedicated to all manner of musical instruments from around the world. There are dulcimers and harps and a small cabinet containing crystal glasses that have been specifically ground to resonate at a certain note–no water required. And there are guitars. There are more guitars than I’ve included in this blog, but these two were my favorite. Four hundred years of ah-may-zing. Check out the detail work in the sound hole. That’s a lot of work for a part almost no one is going to be able to see. And here’s another beauty, also of Italian make. This one was built in the early 1700s by Jacopo Mosca Cavelli, so it is a mere 300 years old. A hundred years, a little fatter, and astonishingly, even more elaborate. 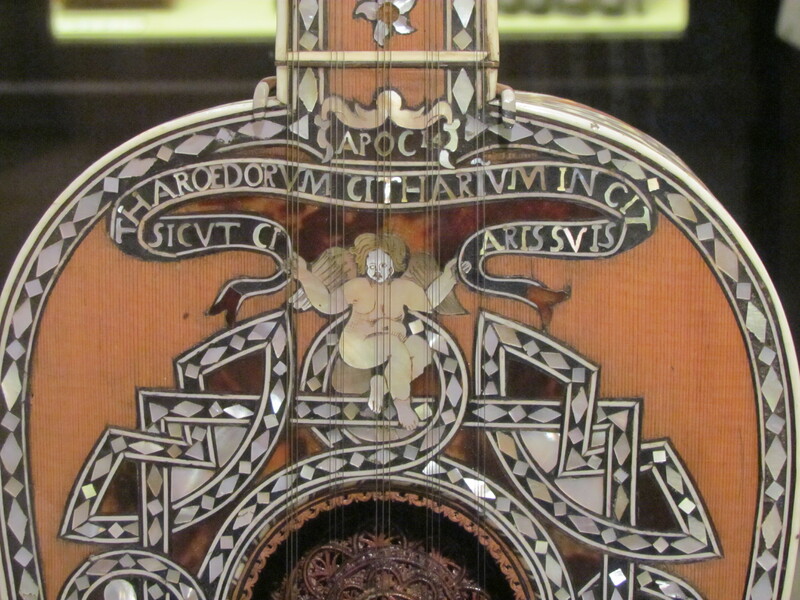 I have absolutely no Latin training at all, but the best I can tell is that this seems to say that this is the sort of guitar that would be appropriate to play at the coming of the end of the world. Latin scholars? Anyone? Someone? The point–other than showing off fancy things–is this. The guy(s) who made these stunningly gorgeous instruments didn’t have power tools and laser cutters to put this together. Those instruments were shaped thanks to the cunning use of steam or the gentle application of constant pressure and the use of a rudimentary lathe. (I admit it: I like the word lathe.) 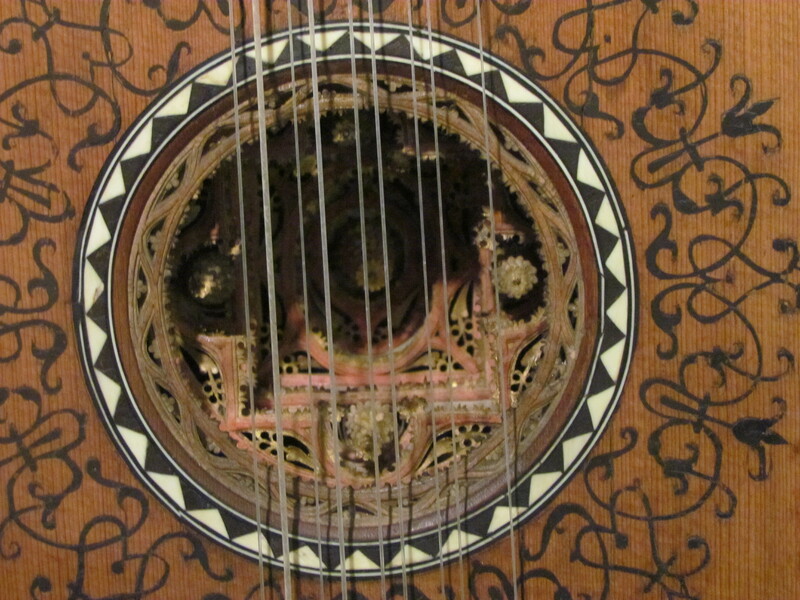 The inlays were carved by hand and placed, piece by often miniscule piece, by tweezers. Once again the sound hole is elaborate, which is something that nobody except the musician and whoever borrowed his guitar would see. And I can barely get it together enough to give myself a little pedicure and get my gnarly feet ready to face the rest of the summer. I mean seriously, I’m probably going to only have to do this once more for the season, before I can stop worrying about it for the fall. Clearly, I’m not doing something right. But I do enjoy looking at the results of those who are capable of getting it together. It reminds me that we can do great things, all we have to do is focus on the task at hand, and do that to the best of our abilities. Unless that task, of course, involves me playing guitar. That, I will leave to the experts. 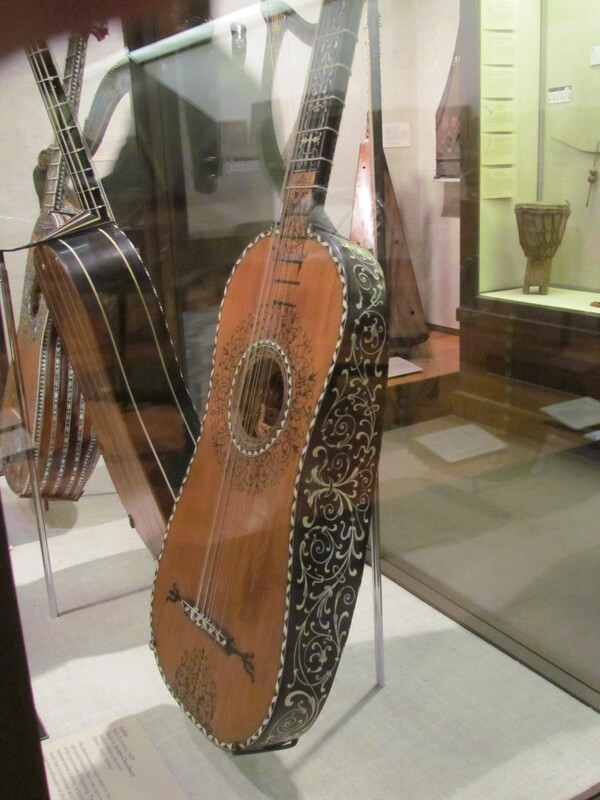 GUITARS at Boston’s Museum of Fine Arts – a great “thank you” for this wonderful gallery! My pleasure! It leads me into what’s probably going to be next week’s challenge…LOL 🙂 Good times. Yeah, they were quite the feast for the eyes. Oh wow. I always love listening to the sound of a guitar. Fannnnnnncy. Bit of an understatement there. These are astonishingly beautiful works of art. You know, the kind that can only be created by the maniacally obsessed, and perfectly appropriate as museum pieces and/or photography subjects. I do maintain a healthy level of skepticism as to them ever having been *insert superlative of choice here* guitars in the critical areas for the people who play them: sound quality, intonation and playability. The guitar, as we have come to love it, was perfected by the Spanish makers during the same time period, with the emphasis on no-frills/all-function (and, of course, the cunning use of steam and gentle application of constant pressure). Several makers’ families, generation after generation continue to this day, with very little modernization. Good question… somethin’ lefty, I imagine. These look like they may have come straight from the imagination of Scheherazade and The Arabian Nights tales. Beautiful and quite fanciful. Or Roberta Flack singing in the background “Killing Me Softly” while Mr. Fancy Pants musician is strumming her pain with his fingers? So cool! Did you ever see the movie “About a Boy”? He’d have to be strumming with his eyes closed. Hugh Grant or Nicholas Hoult? Or both? Loved that movie. And, no, I did not have a fantasy/dream about Hugh Grant. I don’t know what you heard, but it’s not true!!!!! I totally crush on Hugh Grant. You’re among friends.